It can’t hurt is a brilliant English phrase to make you sound like a native English speaker! 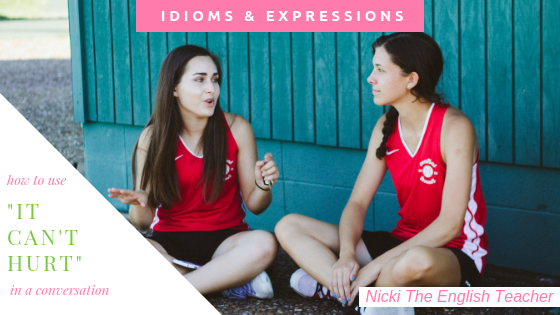 I personally use this one all the time 🙂 English vocabulary like this is great but is only effective when used properly in context so have a read of my examples and then see if you can use it the next time you’re communicating in English. It can’t hurt is used to give advice. You are saying to someone that they should do something because, in your opinion, it might have positive results and it won’t have any negative results. Perhaps your friend feels that they deserve a pay rise at work. You advise your friend to ask their manager for a payrise because you know they won’t lose their job but they might get a salary increase. Perhaps your brother wants to take his piano exam but he’s not sure if he will pass it. You advise him to try the exam because it doesn’t matter if he fails but he might pass it. HOW CAN I USE ‘IT CAN’T HURT’ IN AN ENGLISH CONVERSATION? Well, it can’t hurt to ask! Just arrange a meeting with him. He’s not going to fire you! You should take the exam. It can’t hurt to try! Note – If you use a verb after this phrase, you need the infinitive form (e.g. It can’t hurt to ask). Next Post Feel the fear, and do it anyway! It can’t hurt to sign up now for free English stuff. Haha!! Well obviously I love this example 🙂 The grammar and context are perfect! You’re very welcome 🙂 I hope you get a chance to use it!